Whether you start from scratch or are interested in updating your current landscape, shrubs make the perfect backdrop for seasonal plants and flowers. To maximize both your space and budget, consider planting shrubs. With a bit of planning and a free afternoon, your yard will be transformed into a landscape worthy of magazine covers. Measure the planting area. Determine the width and length of available space and draw a rough draft on graph paper. Use a legend, such as one square on the graph paper equals one foot of garden space. Documenting your available space makes it easier to plan the shrub placement and reduces the possibility of having to dig up and move shrubs later due to overcrowding. Calculate the amount of sun each area gets per day. Either document each hour the sun shines in the landscape area or purchase a sunlight calculator available at Burpee.com or most home improvement stores such as Lowe's or Home Depot. This device is inserted in the soil and, based on the amount of sun it receives, determines whether the area would be categorized as full sun, partial sun, partial shade or full shade. 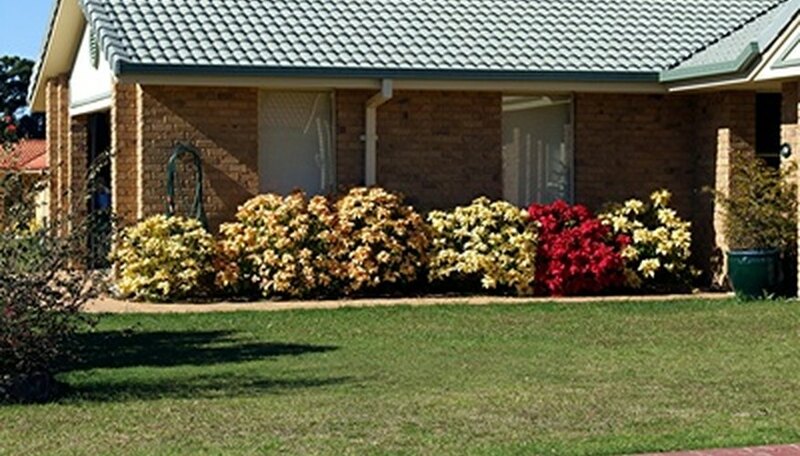 Purchase shrubs that correspond to the available sun requirements your space has. Note the size the shrub will be at full maturity; you don't want to overgrow the planting area. It's better to have slightly bare spots than than to overcrowd the area. Take your graph paper with you when you shop and record each shrub on the landscape space, making sure to calculate the mature size when recording, preventing you from buying too many. Arrange your shrubs from the back to the front. Plant the tallest shrubs in the back and the shorter shrubs in the front so that all the plants receive adequate sunlight. Before digging, place the plants in place to ensure you are satisfied with how they look. Rearrange as needed to achieve the desired look. Dig the holes for the shrubs in the back and set them in. Make sure to break up the root ball slightly before dropping the shrub into the hole so the roots will spread and not die. Add a bit of compost to the hole and cover with potting soil and the remaining dirt. Tap down and step back to review. Make sure the shrub is sitting straight up in the hole. Straight planting should prevent an awkwardly shaped base later. Continue planting until all shrubs are in place, then add landscape material such as cedar chips, pine bark or pine straw to complete the beds. This additional landscape material will also keep the shrubs from drying out. Jeri Sullivan is a freelance writer with over 14 years experience based in South Carolina. She works for Flextronics International as a materials marketing manager and specializes in writing about business start-ups. Sullivan has a Master of Business Administration from the University of South Carolina.